Yoga began to weave its way into Dina’s life during her last year of college when a friend would tell her great stories about her experiences of practicing yoga. Dina was intrigued by the beauty and fluidity of yoga but was hesitant to bring it into her life. It wasn’t until she entered “the real world” and befriended a woman aptly named Hope that yoga began to dance into Dina’s life. Hope convinced her to attend a yoga class where she met Emily Dubin Huresky, her first Anusara teacher. As soon as she came into her first Down Dog and felt both the challenge and the freedom in it, she knew that this was something she wanted to experience again. Ten years later Dina has seen her life moved in so many ways by her connection to practicing yoga – the most profound being the ever-widening circle of friends, teachers and students and the ever-deepening connection to herself. She is forever grateful to all of her teachers both through yoga and throughout her life. 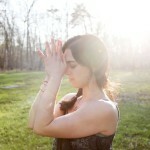 Dina aspires to inspire in others all that yoga has graciously given to her.